The Rental Limo team is excited for the release of Rental Limo Mobile on m.rentalimo.com as 2013 comes to its close. Rental Limo customers can now book limousines as easy as 1-2-3 from smart phones. Users visit www.RentalLimo.com from their cell phones to be automatically re-directed to m.rentalimo.com , prompting the customer with three options: Book a limo, call now, or visit the full site. 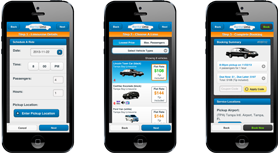 With mobile apps for iPhone and Android still under development, Rental Limo plans to release the iPhone app in early 2014. Until then, please use the Rental Limo Mobile site to book limos using a phone.